JUNE 27, 1880 — HELEN KELLER IS BORN! 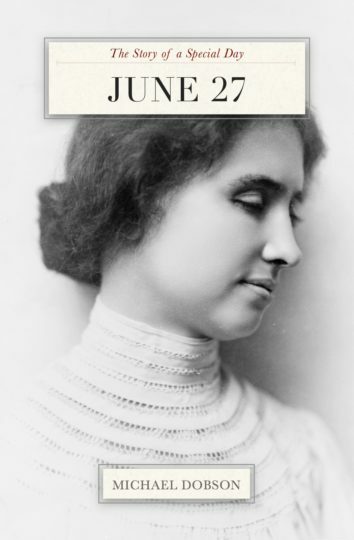 On June 27, 1880, advocate for the disabled Helen Keller is born. Before she turned two years old, she became ill, and lost both her sight and hearing. In spite of that, she became a noted speaker and influential writer. Other people born on June 27 include Bob “Captain Kangaroo” Keeshan, billionaire candidate Ross Perot, designers Vera Wang and Norma Kamali, filmmaker J. J. Abrams, activist Emma Goldman, and pool player Willie Mosconi. Historian Shelby Foote, Who bassist John Entwistle, and actor Jack Lemmon died. On June 27, 1844, Mormon leaders Joseph Smith and his brother Hyrum are killed by a mob in Carthage, Illinois. A rebellion aboard the Russian battleship Potemkin begins, the US decides to enter the Korean War, and adventurer Joshua Slocum becomes the first person to sail around the world solo. Many German-speaking nations celebrate Siebenschafertag, Canada celebrates Multiculturalism Day, and Djibouti celebrates its independence. In the UK, it’s Take Your Dog to Work Day, and in the US it’s National Sunglasses Day. In astrology, June 27 is in the sign of Cancer (traditional) and Gemini (sidereal). June birthstones are pearls, moonstones, or alexandrite; June birth flowers are rose and honeysuckle. Each volume of The Story of a Special Day is packed with rare historical photos and fascinating facts. With 79 pages packed with over 44 historic photographs and illustrations, this book is a feast for the eyes as well as for the brain. A perfect birthday present or anniversary gift, “The Story of a Special Day” will make anyone feel special on his or her very special occasion.